The URPOWER Dog Leash Harness and Collar is made with heavy-duty materials. It’s made from two thick layers of blue jeans & red nylon with orange nylon stitching. The harness comes with the clasp that holds the leash to the harness and has 2 adjustable straps can be adjusted to fit dogs. The material is generally soft with no hard edges and certainly seems strong and should last. The company offers a 180 day guarantee. An excellent choice for a dog collar and leash – we give the URPOWER Dog Leash Harness and Collar for dogs our highest FIVE STAR rating! This Kiwitata Dog Harness is made from a padded oxford cloth and is black and red in color. It’s easy to adjust for different dog sizes and heights. We like this leash for larger dogs like Huskies, German Shepherds or Pitbulls. The leash is a standard 5 feet long. We give the Kiwitata Dog Harness, Leash and Vest Halter FOUR STARS. The SparklyPets Heavy Duty Rope Leash for Large and Medium Dogs is chew resistant as it is made from a braided nylon. This leash and harness is one of our favorites as it is strong with a thick rope, leather joints, metal hook and elastic bungee – to help with pulling and/or controlling your larger dog. There are three colors to choose from; black, green or blue. The company offers a 90 day guarantee. 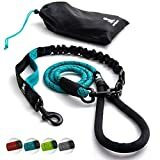 The SparklyPets Rope Dog Leash is one of the best so we give the SparklyPets Heavy Duty Rope Leash for Large and Medium Dogs our highest FIVE STAR rating. The REGYSHOP Hands Free Dog Leash is 51″ long and is made from elastic nylon. With this lease, you also get a waist pouch with three storage pockets. The leash also comes with a carrier bag to store everything in at home. The company offers a lifetime guarantee. We recommend this product for medium to smaller dogs. For larger dogs, we recommend the Pet Dreamland Hands Free Dog Leash, also recommended below. We also like the added products of the storage bag and waist pouch. 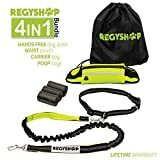 We give the REGYSHOP Hands Free Dog Leash a rating of THREE STARS. The Pet Dreamland Hands Free Dog Leash is a somewhat unusual triple bungee cord product. The elastic construction will take some of the “jerk” out should your dog run faster than you or stop suddenly. The leash length is 59” to 76” by untying the five knots with a stretched length of 70” to 87”. We recommend this leash for large dogs and for those that run, hike or cycle with their larger dogs. We give the Pet Dreamland Hands Free Dog Leash a ranking of FOUR STARS. When buying a dog leash, harness or vest halter, know what you are going to use it for. In other words, is it for your casual evening stroll? Or is it being bought for your best friend to run along side, behind or in front as you jog or bicycle? Many time, dog owners will buy two different styles, depending on their needs. Regardless, don’t forget to take the harness off and let the dog run free occasionally. It’s great exercise and fun for him or her! 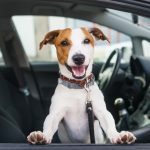 Every dog on the block wants to be the pack leader, but with the right leash and collar in hand owners can reclaim their role as the head of the bunch. 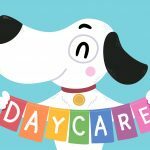 After all, a good leash and collar are essential tools for proper dog training and controlling them while on walks, and in many states it’s against the law to NOT have pets properly collared and leashed. Fortunately, there are several types to choose from, but the options can seem overwhelming. Here are some tips for choosing the best dog collars and leashes for your pet. 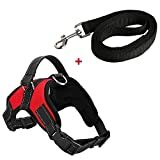 What Are the Basic Dog Leashes and Collars? 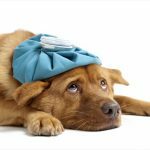 Dog owners simply looking for the quickest, cheapest and easiest solution to be in compliance with state dog leash laws, may find the basic options appealing. Besides the traditional leash and collar, there is another simple option—a slip lead. 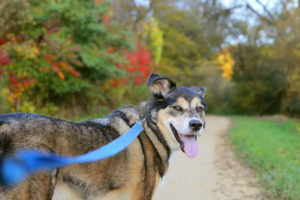 Dogs who aren’t properly trained or who simply adore chasing everything that moves on walks may do best on a slip lead, which is a collar and leash in one. 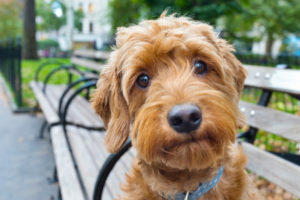 Essentially, when pups try to ‘walk’ their owners or run, the slip knot will pull against their neck, encouraging them to slow down and stay on track with you. 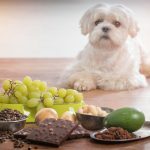 Healthy dogs need walks, and most dog owners do too! Many people are familiar with a dog collar, but what is a dog harness? Dog harness collars are good options for dogs who seem to have a knack for getting out of traditional collars. These collars wrap around their bodies and offer extra support. Harnesses are also ideal for owners who want their dog to pull them around. They can be used while riding a bike or using rollerblades or a skateboard. 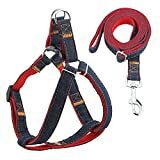 Harnesses are also recommended over traditional leashes and collars for large large dog breeds who tend to suffer from breathing restriction issues. Such dogs include those with ‘squishy’ faces like pugs, those with trachea or throat issues, and dogs with elongated snouts, such as greyhounds. 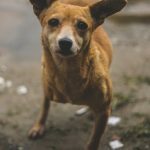 What Is a Reflective Dog Collar or Leash? We know what reflectors are, but what is a reflective dog collar or leash? These can be found in just about any model owners prefer, and they can be a lifesaver when walking pups in the evening. Just like bicyclists use reflectors and lights, collars and leashes designed for visibility are ideal. Owners can even purchase reflective tape at a local hardware store and create their own. There are many kinds of fun options for reflective collars. Some collars even include rechargeable and programmable LED lights, so your dog can become the king of the block. Beyond the traditional leash, there are a number of options that dog owners have. Adjustable leashes are very popular. They allow owners to control the length of the tether, which makes it and excellent tool for dog training. Retractable leashes allow owners to give pups a bit of freedom on walks. However, these leashes also have a locking mechanism that allows for complete control when needed. And then, there’s the cream of the crop for dog collars — dual use combinations. Dual use collars feature all the bells and whistles your dog needs. They often have reflective strips and waist wraps – for owners who want to run with their dog. Some also have poop bag holders, shock absorbers, and even mini-flashlights for late night outings.